Killadangan House is a lovingly restored period house overlooking Clew Bay on the outskirts of Westport town. A Georgian style building, it was erected in the 1850’s as a grand estate house for the land agent of George Bingham, 3rd Earl of Lucan, who was the overseer of the lands that stretch from the Barony of Murrisk in West Mayo to the Delphi Valley in the South. 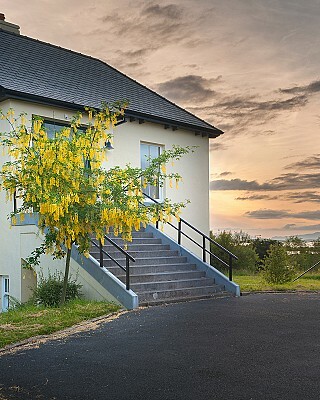 At Killadangan House, we offer luxurious self catering accommodation to guests who want the close proximity to the many amenities of Westport town, but also want the privacy, space and luxury of a grand country house. We offer exclusive weekly rentals to families and groups all year round. This is a wonderful house in which to spend a week or two with family and friends exploring all that Westport and the Wild Atlantic Way has to offer. Killadangan House sits on an imposing elevated site in the shadow of Croagh Patrick within minutes of Westport town. The spectacular panoramic views from Killadangan stretch over Clew Bay to Mulrany, Achill and Clare Island beyond. Killadangan House offers oodles of history and has benefited from meticulous and tasteful refurbishment over the last 5 years by its present owner. In keeping with period and style of the house all rooms are customized with original fireplaces, furniture, paintings and carpets. Granite steps lead up to the entrance level where we have a gracious reception hall, an elegant drawing room and dining room, divided by original folding doors, with magnificent views over Clew Bay. There is a fully equipped kitchen, smaller dining room, and a very cosy parlour. There is also The Old Kitchen, with its huge original fireplace. This is a wonderful room for massage, yoga sessions and treatments, all available on request. We also have a state of the art sauna room available for the sole use of our guests. Outside we have mature private gardens surrounding the house, where we can offer unique bushcraft sessions. We are also Irelands newest exclusive venue for small bespoke weddings of just 10 to 26 guests. This beautifully restored period house, built in the 1850s, is now available to you for your small intimate wedding. We cater exclusively for weddings of 10-26 guests. A romantic and very special place where you can relax and celebrate in style with those closest to you, surrounded by antique furniture and paintings, inspiring Georgian features, large fireplaces and luxurious accommodation. We are certainly offering something new in the world of weddings and that is an exclusive venue catering specifically for bespoke, intimate celebrations. Not everyone’s idea of a perfect day involves 200 guests, yet larger venues can leave a small group rather short changed in terms of choices and service. We are delighted to introduce Killadangan House to discerning small wedding groups where you can celebrate your special day with your closest circle in style, elegance and comfort. Because you will have exclusive use of Killadangan House for two days we encourage you to fulfil those long held dreams of your perfect day. Any specific theme, decor or custom you have always wanted we will put our heads together and beg, borrow or steal from our contacts to help you with your vision.